"This book is a perfect example of why it's so hard to turn a good nonfiction picture book into an audiobook. Narrator Polly Collier is very good. Her strong, clear voice makes her sound much like a teacher, and I appreciated her explanation to young listeners that she would be reading the text portion of a picture book. However, the presentation is still confusing, and I wonder how nonreaders and early readers will be able to conceptualize the idea of words and pictures. It's a wonderful book, full of interesting trivia, but I think nonreaders will need someone to help them make the connection to the pictures; transitional and comfortable readers will be fine." 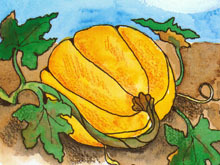 "Another example of Gail Gibbons' excellent treatment of a popular nonfiction topic for young students, The Pumpkin Book (Holiday, 1999) explains the planting, cultivating, and harvesting of pumpkins using bold illustrations and simple text. The book is narrated by Polly Collier in a deliberate, unenthusiastic manner that emergent readers might find boring. She carefully explains the page-turn signals (on Side A only) and that the words at the bottom of the page are read first and then the words on the upper "picture" section of the page are read. Most of the words in the upper section are labels of plant structures and pumpkin varieties, and having these words narrated between the reading of the text could confuse young listeners. A well-written book on a popular topic, this title does not transfer successfully to the audio format."